There’s just no getting around it. Everybody wants a beautiful smile. It’s infectious, magnetic and engaging. It screams success and positivity. 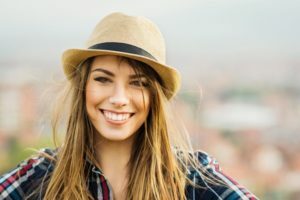 Furthermore, your cosmetic dentist in Palm Bay says that studies show that 71% of those polled believe that people with a nice smile make friends more easily than those with crooked teeth. And 85% of adults consider a person’s smile to be very important at an initial meeting. However, if you find yourself feeling left out and desire to build your self-esteem through improving your appearance, there is help for you. You can now experience the power of an award-winning smile. There are multiple methods for delivering the smile you desire, and restoring your confidence. Porcelain Veneers – This is a great way to address a chipped or cracked tooth. Made from ceramic, these tooth-shaped shells are used to conceal damaged teeth, creating the appearance of a gorgeous smile. This method targets the teeth that are visible when talking. Metal-Free Dental Restorations – Beyond just restorative dentistry, crowns and bridges can be used for cosmetic purposes, as they can improve flaws like severe staining, malformation, or uneven tooth size. Your dentist in Palm Bay uses Bruxir zirconia material to create dental crowns, combining the benefits of strong gold crowns and the natural look of porcelain crowns. Dental Bonding – This method uses tooth-colored resin to fill damaged areas of the tooth, used to reshape, brighten, or correct a flawed smile. The resin is applied to the teeth and cured with a light to harden the material into place. Teeth Whitening – If your teeth have grown less appealing due to staining, whitening can help tremendously. Using the KOR method, your dentist assures you that the process will be effective and painless. Botox and Dermal Fillers – Once you get your teeth looking the way you’ve always desired, it only makes since to perfect the rest of your facial appearance, ensuring that your lips, skin and teeth work together to produce the most beautiful version of yourself imaginable. Once you’ve achieved this new, rejuvenated version of yourself make sure to do the things necessary to maintain it. Be sure to brush and floss your teeth twice a day, and visit your dentist every six months for cleaning and examinations. Your ability to maintain these small habits will reinforce any procedure you have done, and ensure the longevity of the newfound self-esteem that you are enjoying. Dr. Christopher Nowacki earned his doctor of dental medicine in 2004, and has been working since to enrich his skillset and knowledge base. He enjoys the art of dentistry and prides himself in taking time to deliver personal care to each patient. Dr. Nowacki practices at Beautiful You Dental and wants you to be able to say that “there is a dentist near me.” He can be reached for more information at his website.